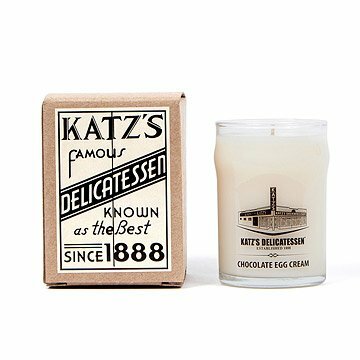 Bring the iconic Katz's Deli home with this beeswax candle, poured into a piece of Katz's glassware. Made famous by its delicious bagels, larger than life matzo balls, and a very special visit back when Harry dined with Sally, New York's Katz's deli is brimming with iconic appeal. Bring this Lower Manhattan staple home with this beeswax candle, poured into a piece of authentic Katz's glassware. Each candle is made with essential oils and scented with notes of their famous chocolate egg cream, perfect for New York lovers and lifelong residents alike. Hand-poured by Joya in Brooklyn, New York. She just LOVED this candle and even sent me a picture of a chocolate egg cream she made (the candle made her do it!! )...she misses friends and family so much and it made her feel more at home after her move West!!! My father grew up going to Katz's frequently, and this candle completely brought hik back to those days! It was such a unique and special gift. Some scented candles have a strange smell, but this one is perfect and has such an inviting aroma. It made us all want dessert! I love egg creams and you can't find them alot anymore. It reminds me of sitting at a soda fountain counter when I was young. How life has change.